It may not come as huge shock to regular readers that I was somewhat of a nerdy child. I liked books more than kids my own age and found them better company. This was, to some extent, Shakespeare's fault. I grew up in Darlington, and my parents started going to see the RSC touring productions at the Newcastle Theatre Royal sometime during the eighties. They would book tickets with friends to each show (they even held parties to arrange the bookings), and while the RSC were in town they would disappear off looking rather glamourous in their theatre going outfits and come back talking about the costumes and the actors. I was sold on the whole enterprise before I even got to the theatre. There was quite a lot of debate as to when it was appropriate to take me and my brothers. I remember very clearly the moment Mum and Dad realised that my brother was going to be on a school trip the night they had booked him a ticket for Midsummer Night's Dream, and decided they might as well take me instead. I was eight. I put on the best clothes I had (probably something from clothkits) and Mum explained the story as we drove up. I have no idea if I really understood it at the time, but I certainly thought I did. I fell absolutely in love with Shakespeare right then, and I must have behaved myself, because after that I was a regular addition to the party. We used to eat out afterwards with Mum and Dad's friends, walking down to an Italian pizzeria under the huge flocks of chattering starlings which used to roost on the Victorian and Georgian frontages of the city centre. Mum didn't think it was a good idea to take me to the tragedies - probably too traumatised by the crying fit I had when she read me Jane Eyre - but by the time I was eleven I was allowed to go to the histories, so saw the 1984 production of Henry V starring Kenneth Branagh. And that was a whole new love affair. I learned the whole of Chorus's 'muse of fire' speech just in case he ever wanted me to sub in. I was a bit pissed off when Derek Jacobi got to do it in the film version as it happens and was still performing it as a drunken party piece at University a decade later, occasionally in the voice of a newly encrushed eleven year old. Though that didn't stop me going ditching lectures to see Branagh's film version of Hamlet twice in two days when it came out. In between times I won an essay prize at school and spent my book token (at Dressers which anyone who grew up in Darlington will appreciate), on my own copy of the collected works. I still have it. I remember when I took it round to my Grandmother's to show off, she said, 'just think, you'll have that your entire life' and I recall very clearly looking down at it in my hands and imagining the pages yellowed, and realising I would age, and eventually I'd be holding this same volume with hands which looked like my grandmother's. I hope I shall. 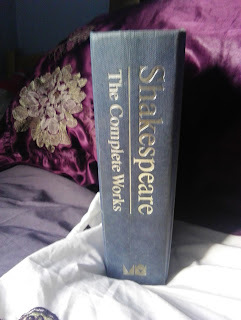 So Shakespeare is not just Shakespeare for me. He's my first theatre, the way I learned to love language. He's my first sonnet, he's pizzas and starlings, essay prizes, A levels and the time I saw Pete Postlewaite play Lear at the Young Vic with the man who is now my husband. He's a place of safety when the world is unkind, he's how I first understood time and desire and, thanks to my parents I got to learn and understand the rhythm of his language before it was forced down our throats in the schoolroom. I wish everyone could discover him that way. 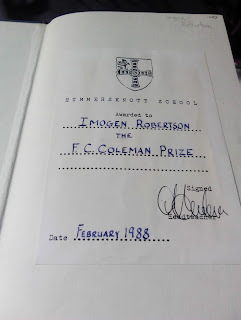 Wonderful memories, Imogen. I studied English at a mediocre grammar-then-comprehensive school in the East Midlands. What was good about it was our many trips to theatres in Leicester, Nottingham, Sheffield, Coventry and Oxford and especially the RSC at Stratford on Avon. These visits were how and why I fell hook, line and sinker in love with Shakespeare. Reading his plays in a stuffy classroom is a very poor way to understand and appreciate his art and craft. You have to see them and the many, many ways they are interpreted. Who can forget an avalanche of tennis balls across the stage in Henry V, or the non-speaking actor playing the centurion who accidentally stepped back and fell straight down through a trap-door into bowels of the earth right in the middle of Mark Anthony's famous speech in Julius Caesar? Top marks to the latter who fought the urge to laugh and bravo to the poor young actor who probably got the most magnificent standing ovation ever at the final curtain call. Shakespeare is a huge part of my life. ha! Good for him! Thanks, Sally - totally agree. "I liked books more than kids my own age and found them better company." God, I can empathise with that! Kipling for me. Mowgli, Bagheera and the crew of the We're Here were certainly far better company than other kids. It took me a long time to catch on to Shakespeare, but when I did - reading 'To be or not to be' during a detention - I did, headlong. It seemed to me that the man had taken the thoughts right out of my head and written them down in beautiful poetry four hundred years plus before I was born. I saw Branagh play Hamlet at the RSC. What that man can do with his voice is amazing. Three different inflections and four different meanings in one word. Great post - beautifully written. I very much enjoyed it. Thanks, Susan! Very kind and I know just what you mean. Oh Lord did I fall in love with Branagh with Henry V, movie version (I hail from Montana). That you saw the stage version I'm green from head to toe with jealousy. My BA degree is in theatre -- as a stage manager. Acting scares me silly and I only directed one community theatre production, a Neil Simon. I didn't make a career of it because I discovered I didn't want to leave Montana though I had had dreams of jetting off to London and working in the great companies. My biggest theatre regret is not having the chance to stage manage a Shakespeare play. I think the earliest play of the Bard's I saw was as a kid was a community theatre production of Romeo and Juliet. And it was Montana Shakespeare in the Park's version of Comedy of Errors that made me switch from a journalism major to theatre my sophomore year. I was also lucky enough to encounter Shakespeare as a child, Imogen, and I quite agree that's the best way.